Romantic dramas are always at their best when at their most sophisticated, as Richard Linklater showed with his fantastic ‘Before’ trilogy. Good performances bolstered by a smart, believable and realistic script are tantamount to forming a connection with the characters, since anything else has an air of superficiality about it. Roger Michell and Hanif Kureishi are a pretty perfect team for fulfilling the criteria, since the films they’ve worked on together always have a spark and an emotional edge that lends them to making a truly touching and funny drama. Michell’s two leads, Jim Broadbent as Nick and Lindsay Duncan as Meg, are fantastic, and embody their characters’ various insecurities fantastically as Broadbent portrays a man lost in unfulfilled dreams, and embittered by a career that never lived up to his high expectations, juxtaposed well with Duncan’s characters’ feelings of lost freedom and a desire to recapture a sort of love that might be lost after thirty years of marriage as they attempt to use their trip to Paris to reinvigorate it. Together they embody the taciturn relationship that has been together for so long, from idyllic and pleasant to beyond the point of repair within the space of an hour as their personalities and desires clash. While the first half of the film makes for interesting watching and has its amusing and heartfelt moments, the film truly comes to life with the arrival of Jeff Goldblum on screen as an old friend of Nick’s named Morgan, whose highly enjoyable and very quirky performance is what people like to call ‘the Goldblum’, a twitching, witty delight that he is uncannily good at producing time after time. He brings a different dimension to the film, exacerbating the conflict between Nick and Meg merely with the details of his life, and how his problems, namely that he doesn’t know if he wants love again and is unsure about his life choices even though he has become a successful writer, clearly have a lot of effect on both Nick and Meg. This, coupled with Morgan’s continued reverence of Nick from their university days together and who expected great things from Nick, means that the opportunities he has missed come to hit him much harder. Kureishi and Michell do a great job of mixing these sad revelations with a lot of humour, and Nick’s interactions with Morgan’s teenage son are particularly amusing as he uses him to hash out his problems, and gets suitably sage advice from a teenager with no experience of what he’s talking about. All these tensions are built up wonderfully on both sides, and the script contains a great number of gems that have you thinking as well as laughing, feeling sorrow and rejoicing all at the same time. It’s a beautiful tale of every day problems mounting upon a couple who feel like they’ve run out of direction, and know that their wish for a fresh start might be just a little bit beyond their reach. 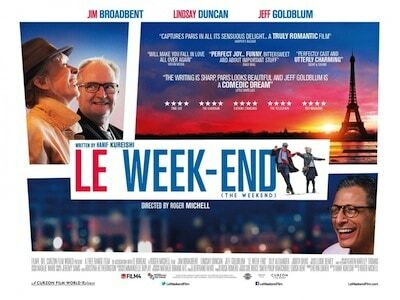 ‘Le Week-End’ is a wonderfully touching tale that really rises to a crescendo in its second half, and is certainly a massive success, bolstered by wonderful performances and brilliant writing, it makes sure it leaves an emotional imprint on you, even if you can’t directly relate to Nick and Meg’s situation. A wonderful, bittersweet success.